The St. Kriz (Cross) beach is located in the northern part of the island of Ciovo, in Arbanija. Near the beach there is a monastery after which the beach is named. Access to the beach is easy and it can be reached by car, on foot or by public transport. But if you go out of Trogir, we recommend that you go by car, scooter or bicycle, because the beach is 4km from the center of Trogir. This pebble beach is suitable for family vacations due to fine gravels, shallow sea and a multitude of natural shades. You can rent pedal boats on the beach that will provide a lot of entertainment to the whole family. The youngest will enjoy the water park, while a little older ones will be thrilled by the beach volleyball. The lovers of beach relaxation will find their ideal place in the pine woods that surround the beach, while those eager for fun and good music will enjoy the beach bar. There is a cafe near the beach where you can refresh yourselves during the summer heat and a snack bar where you can eat a simple meal. The lovers of sweet will be also delighted with an ice-cream near the beach of St. Kriz (Cross. 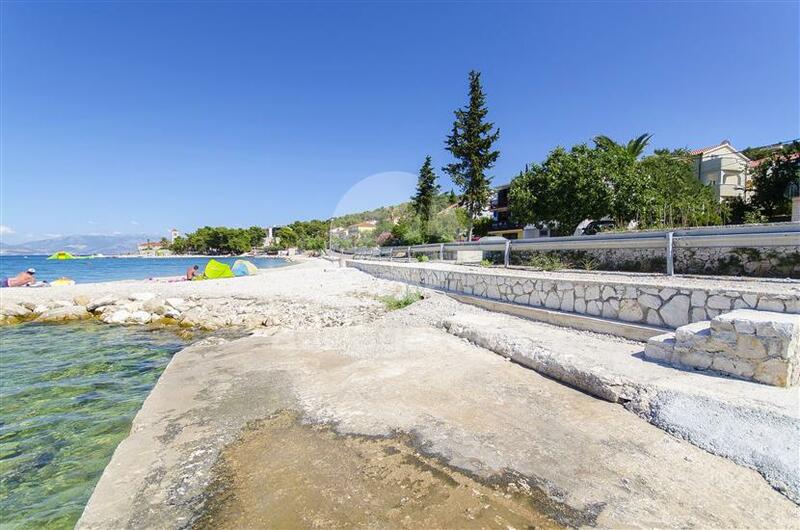 Relax with your loved ones on this beautiful, pebble beach and enjoy the clean sea.